The late Emmy Award-winning producer Danny Arnold couldn’t have come up with a better script for his wife’s homebred colt Turallure than what transpired in the Ricoh Woodbine Mile Stakes (Can-IT) Sept. 18. Racing for Donna Arnold’s Four D Stable, Turallure captured the seven-figure stakes to secure a starting berth in the TVG Breeders’ Cup Mile (gr. 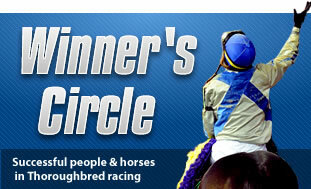 IT) at Churchill Downs Nov. 5 and a chance to take on mighty three-time Mile winner Goldikova. The Woodbine Mile was Donna Arnold’s biggest career win. “It was so thrilling that I couldn’t get over it,” said Arnold, who screamed herself hoarse during the race. Watching Turallure run was a new experience for Arnold, who hadn’t seen any of the colt’s previous 14 races in person. After Turallure won the Bernard Baruch Handicap (gr. IIT) at Saratoga in August, the Los Angeles native figured she was missing too much of a good thing and decided to start watching his races in person. “I had watched them on television or on the computer because I didn’t want to bring him bad luck,” she joked. Arnold, who first went to the track as a youngster with her family, became a racing fan after attending the races with her husband. The Arnolds met on the “Tennessee Ernie Ford Show.” “Danny was a writer at the time, and I was a singer and dancer in the show’s ‘The Top 20’ for four years,” Arnold said. She also found time to perform in an ice show in Las Vegas. “I was one of the few who auditioned who could skate,” Arnold said. Danny Arnold chose the name Four D Stables to honor his family. The Arnolds’ two sons are David and Dannel. Four D’s first big horse was Turallure’s great-granddam Parioli, who did all her racing in Europe and won six French group III stakes in the mid-1980s. The daughter of Bold Bidder twice was group I-placed. Parioli has turned out to be the family’s foundation mare. “Every horse I have today has come from her,” said Arnold, who planned the mating that produced Turallure. She sent the Wekiva Springs mare Personal Allure to Canadian Horse of the Year and Triple Crown winner Wando, who at the time was standing for $10,000 at William S. Farish’s Lane’s End Farm near Versailles, Ky. Wando currently stands at Gustav Schickedanz’ Schonberg Farm near Schonberg, Ontario, Canada. Turallure was foaled at Robin Scully’s Clovelly Farms near Lexington, where the Arnold family has boarded horses for 30 years.